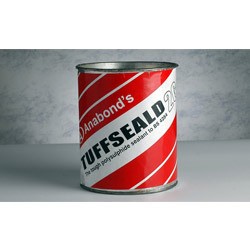 Polysulphide Anabond Tuffshield is a premium grade two part sealant based on Liquid Polysulphide Rubber. They are used for sealing expansion joints where large movement are anticipated in concrete constructions. They also come in handy while sealing joints of dissimilar materials like glass, aluminium, steel cladding, glazing, tiling, tanks and water retaining structures. They are highly used in sealing high traffic areas like airports (Runways), bridges etc. Tuffshield exhibits excellent weathering characteristics, with excellent resistance to moisture, snow, heat and Ultra violet light. It cures fast with minimal shrinkage. They are available in self-leveling pourable grade as well as gunnable Non-sag grades depending on the application. Anabond Manufactures Industrial Polysulphide Sealants. This is a two part Polysulphide and requires on site mixing which cures chemically. These are available in Gun grade BS 4254 (Grade @G) and pouring grade BS5212 (GRADE PG). Polysulphide are widely used in construction/expansion joints of pavements airport runways and buildings. •Cures to form an Impermeable material. •Accommodate the joint by deformation. •Accommodate cyclic changes like temperature, moisture, vibrations etc. •Strong adhesion with the joint faces, no peeling at the corners when there is a deflection of joints. •Good impact resistance without cohesion failure, resist the load, stress due to compression, tension and impact. •Must resist flow due to gravity. •Should have a good flexibility at all service temperatures. •Not adversely affected by aging, weathering, freezing of water, light, water vapor, growth of the fungus and human damage. •Good fire resistance and fuel resistance. •Partial reparability. •Low maintenance cost.